Before I get to this wonderful pumpkin coconut pie, I need to vent. I am going on at least a month of serious sleep deprivation. Like going to bed at 2am every night and waking up at 7am. Bad, I know and as a neuroscience student I know sleep is necessary for proper brain functions. My days are spent trying to stay awake and since I’m not a coffee drinker, tea does a bad job of keeping me alert. But there just doesn’t seem to be enough time left in the day after lab to come home, cook, clean and do all the blogging I need to get done. I am struggling and should really find a better way of dealing with the rising amount of things to do. Slowly, things have been cut off my nightly schedule. First went the gym and then it was any hanging out with friends during the week except of course Grey’s night. My poor husband just looks at me hopelessly. I clearly need to be more efficient with blogging and prioritize what is important otherwise I am going to sink. I don’t even know how people with full-time jobs and kids do this. What’s your secret? I need the magic equation. 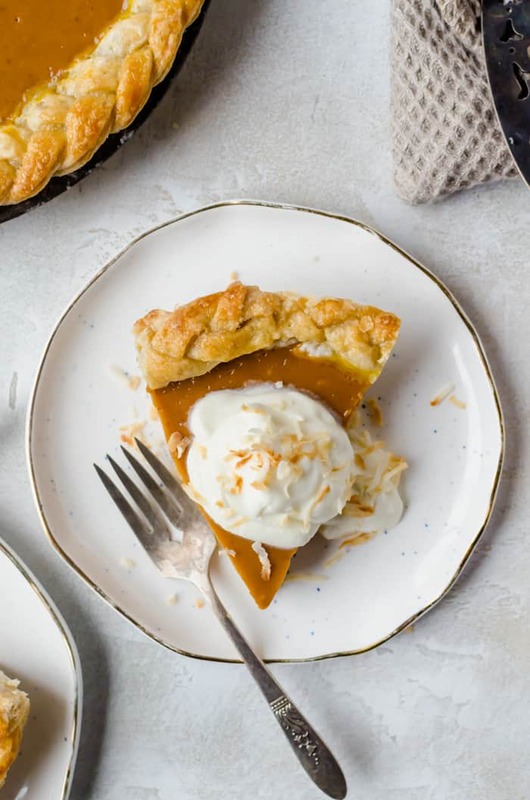 What does sleep have to do with this pumpkin coconut pie? Absolutely nothing and I assure you sleep will be the last thing on your mind when you try this pie. This is Pie #2 of Pie Fridays! Remember the pear walnut chocolate pie from last week that started us off? It was spectacular. I am so happy you guys liked the idea of more pies around here. For this week, I wanted to make a pumpkin pie since I’ve never made one but instead of a traditional one, I added my own twist to this Thanksgiving classic. Before you go all, “coconut? Isn’t that an unusual match?”, I am here to tell you that it is not! 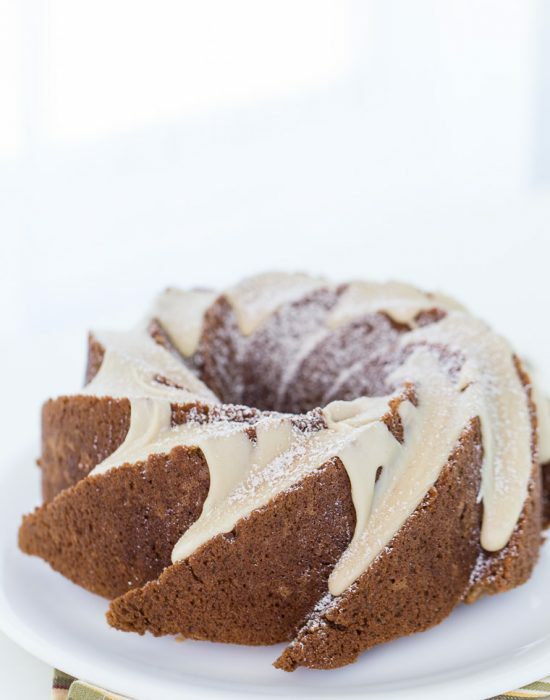 Coconut and pumpkin are perfect together just as pumpkin and maple go together. 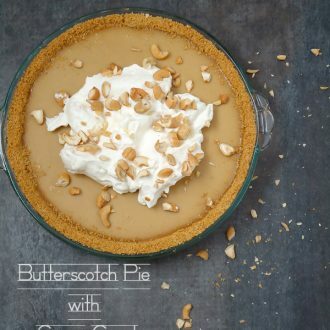 Trust me, even if you don’t like coconut, you will love this pie. The coconut flavor here is not overpowering as I would have liked but I wanted the pumpkin to be the star. 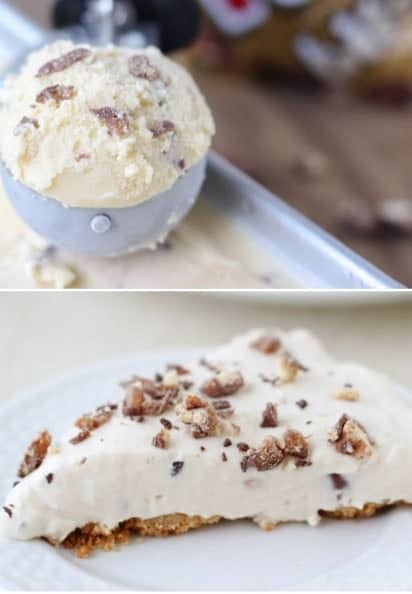 Feel free to use coconut cream or more coconut rum to enhance the flavor if you are a coconut lover like me. Either way, this pie is a creamy delicious pumpkin pie that would be a great addition to your Thanksgiving table! OK so I cannot slice a pie for the life of me and with this pumpkin coconut pie I couldn’t hide that fact any more. There was no oozing filling to hide the crooked lines. Of course, it didn’t help that I didn’t let the pie cool for the recommended time or chill or that I didn’t grease the pie dish to enable easy crust release. But according to this article I came across in Nature Neuroscience journal (yes I am a nerd, I know it), slicing a pie is no piece of cake. It made me feel so much better about my inability. Apparently slicing a pie has everything to do with your frontal cortical organization and some people have deficits in the categorization necessary for activities such as slicing of beautiful pie. This is my explanation and I am sticking with it. Thank you. On that totally nerdy note, I’d like to inform you that I will be attending the annual Society for Neuroscience conference in San Diego next Friday!! If you have been to the area, or familiar with it, I’d love to hear any recommendations of places to eat and of course bakeries to visit. I’ll be there for a week and I’m sure I’ll spend most of my limited free time eating so please send me some ideas. 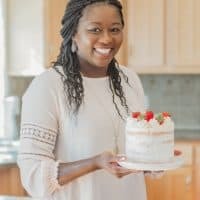 Sprinkles Cupcakes is on the list already but I’m looking for local favorites as well. Have a great weekend and enjoy this pumpkin coconut pie! 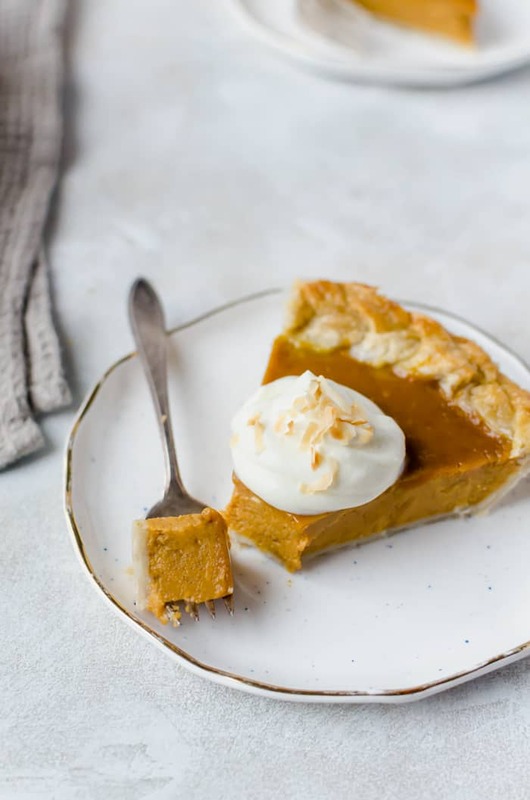 This pumpkin coconut pie is creamy, sweet and perfect for every holiday table. Prepare ¼ cup ice-cold water and keep in fridge. In a food processor, pulse the flour, coconut, shortening, 2 tablespoons butter and salt until combined. Add in the rest of butter and pulse until the mixture looks like coarse meal. Sprinkle about 2 tablespoons cold water over mixture and pulse until dough comes together in clumps. If dry, add a little bit more water (1 teaspoon at a time). Remove dough from processor and form into a disk. Wrap in plastic wrap and chill for at least an hour. The dough can be made up to 3 days ahead. Keep chilled. Let stand at room temperature 15-30 minutes before rolling out. Roll out dough on a lightly floured surface and fit into a 9-inch round pie dish. Press the dough into the bottom and up the sides. Using sharp shears, trim the overhanging dough, leaving about 2-inches. Fold overhanging dough under itself and crimp the edges. Chill for 30 minutes. Heat oven temperature to 425 degrees F. In a medium bowl, gently whisk all the ingredients until combined. Pour the filling into the prepared pie crust. Place dish onto a baking dish and place in oven. Immediately reduce the temperature to 350 degrees and bake for 1 hour. 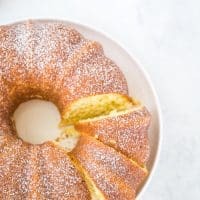 Sprinkle additional coconut flakes around the edges and bake for additional 10-15 minutes until the center is almost set and slightly jiggly. Let pie cool on a rack completely, about 2 hours, before serving. I am not a huge fan of pumpkin pie. In fact, one little slice at Thanksgiving is enough to last me all year. The addition of coconut though takes this pie up a notch in my book. It looks extra special too! Thanksgiving is the only time I have a slice too but I’m ashamed to report that I’ve had three slices of this already. The coconut made all the difference. Great flavor combination here! And I am loving Pie Fridays, keep the pies coming girl! Thanks Meghan!! I’m glad you are a constant source of support :)). Have a great weekend!! This pie looks amazing! Definitely have to try to make it. Please go to old town and el coyote restaurant! Cute little old Spanish ladies make tortillas table side ! Get anything with their queso and you won’t be disappointed! LTP thanks for your first comment!! And I will definitely try your recommendations. I wish you were coming this year :(. But I’ll report back on my findings!! I’m the worst at cutting pie. I love that you blended coconut and pumpkin together! This is going on my Thanksgiving line up! Thanks dear! I’m hoping I start a heathy habit soon. I love your nerd note. 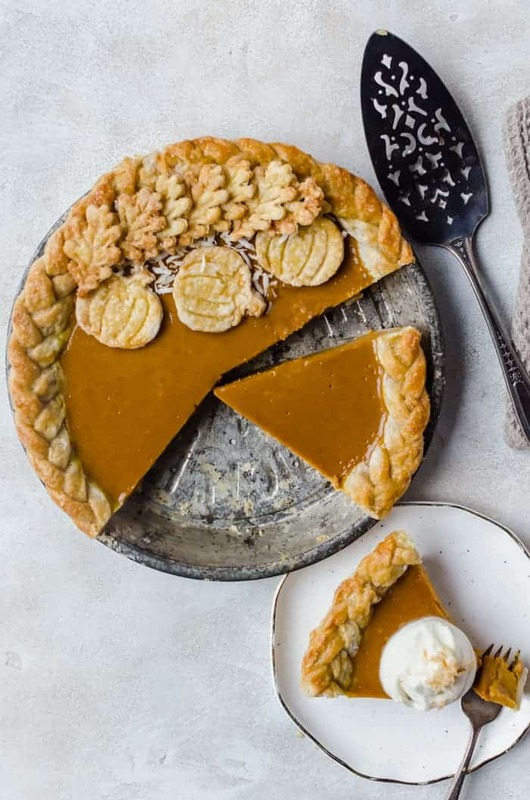 Great pie idea, I never would have thought to mix coconut and pumpkin. Brilliant. I want to sweeten this with maple and honey. Oooh I feel your pain! I’ve been a little bit sleepp-deprived since school started again :(( There’s so much to juggle up and not enough time to do everything, it’s so annoying! Your pie sounds delicious, Zainab! I love the idea of that flavor combo. My goodness, I don’t know how you do it with a baby and two boys. Geez, I will quit whining because you are a superwoman that gets it all done. I will look to you for some of the secrets then lol! I am a big fan of pumpkin pie, but never had it with coconut. 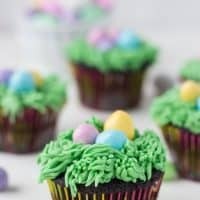 I had to visit your page and have to say you have gorgeous looking food here. Saw this on pinterest and go quite interested. Love it. Blogging…omg..is a lot of work, I hear ya. Love, love, love this! Visions of a coconut pumpkin pie have been swirling around my head but I haven’t made one yet. This is a beautiful vision right here! You did a great job. Hi and thanks for sharing this pumpkin pie. It looks amazing and I bet it is delicious. I saw it on best of the weekend. Thanks Julie for stopping by!! you poor thing! You need sleep!!! At least there’s pie, I suppose. This looks reeeeally good. Like really really good. I totally need to try! 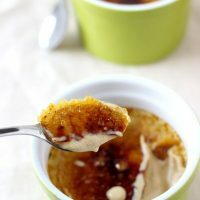 What a delicious twist on pumpkin pie! I adore coconut, but alas, the hubby does not. He will not let me tweak our traditional pumpkin pie one bit…phooey. Enjoy your time in SD!!! 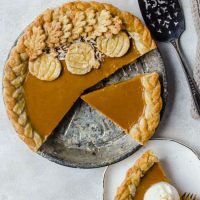 I’m not big on pumpkin, but I would like to try this pie with sweet potato do you have an estimate of how much to use in place of the pumpkin. Thanks. Hey Jackie, what a great idea using sweet potatoes. My husband requested a sweet potato pie and I made it just this evening. I used 2 cups of sweet potato puree with 1 cup of milk so I think you can substitute pumpkin here by using 2 cups as well. Let me know how it turns out. I think sweet potatoes will be great with coconut!! 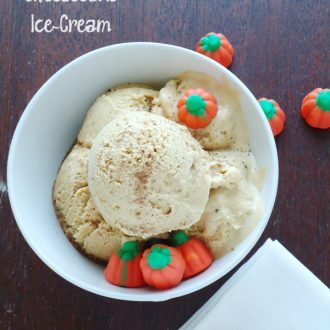 Pumpkin and coconut – oh my, I just died. What a pie! Like, this is beyond perfect! Pinned! Thanks my dear. I love the combination too! Thanks Allie!! The photos were trouble with the orange-y pumpkin but I love how they turned out. Hi Zainab, thanks so much for stopping by my blog. 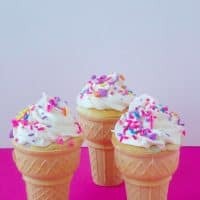 I am now a follower of you on Pinterest, google + and bloglovin. It would be really nice if you follow me back too. Take care and have a great week. P.S. I have to tell you again that this pumpkin pie looks amazing! Thanks Stacy. I’m always with coconut milk in my pantry and I feel like I abuse it sometimes but I just love it. It made this pie! I swear we need more than 24hrs in the day lol! This recipe combines two of my all time favorites — pumpkin and coconut. It’s bound to be delicious. And there’s coconut rum in here? i’ll take any opportunity to have some Malibu, thank you very much. Thank you Jamie! It looks like it’s just going to be an on-going battle until I find a balance and be more efficient. With everything there is a learning curve lol! So I will, unfortunately, tell you that my secret is sleep deprivation….but I’m not sure that’s what you want to hear! Such a beautiful pie!! I love the subtle coconut infusion. That helps lol! At least I’m not the only one walking around in lab like a zombie. What an absolutely beautiful pie! And I love the combination of coconut and pumpkin. What a great flavor combo! Love this pie. Thank you Carrie! Pumpkin and coconut really go well together and I’m glad I discovered this. I’m still trying to make my way through your 30 days of pumpkin…so far I’ve tried the pumpkin glazed turkey legs and we loved them. The boy didn’t want to share his drumsticks at ALL. Your photography is spectacular! I can only dream of such skill. Maybe I shouldn’t say dream. LOL! It is hard to fit in blogging with everything else. I do work full time but my kids are grown. My husband is disabled and for some reason my cat seems to be sick all the time. I think he spends too much time on the bed with the hubs. 🙂 So I guess my point is that not sleeping enough is the only way I know to make this all happen. I also agree with the coconut / pumpkin comments. Yummy combo! Zainab, you are an evil genius! 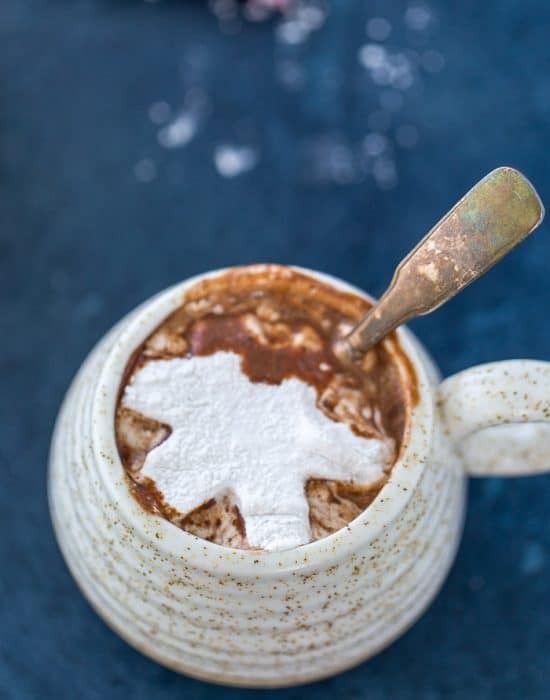 This looks like everything I want in a pumpkin pie but didn’t even know I wanted 🙂 And I hear you on priorities getting wonky, especially during this time of year. But you are so awesome that I know you will figure out a way to make it all work (and then, please, divulge your wisdom to me!) Have so much fun in sunny San Diego! 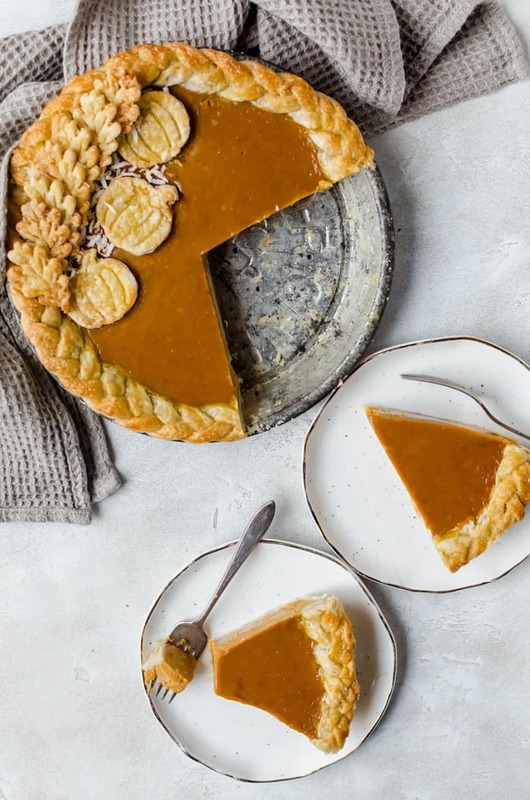 Coconut and pumpkin pie? Yum! I want this on my table no matter what time of the year….. 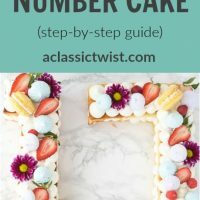 I see you’ve linked up this great looking recipe at the Cast Party Wednesday link party. 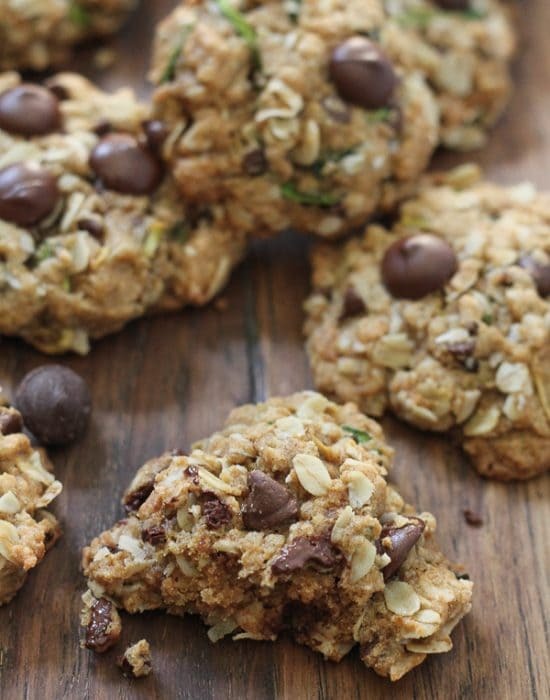 I’d love for you to come share it on my new link party – Required Ingredient Recipe Link Party – that just went live. Every Sunday I feature a different ingredient and this week it is pumpkin.